ROSEN: It won’t please my Twitter followers to hear me say it, but I’ve been dismayed by the treatment of Marie and Jen on Twitter and other social media. They are routinely not only vilified but really derided and mocked in intimately personal ways that I think bespeak a certain amount of sexism. ​KURTZ: So you do think that those attacks, when they get very personal, are sexist. ROSEN: Let’s put it this way: I don’t think the same kinds of attacks would have been directed at male press secretaries in previous eras or this era. 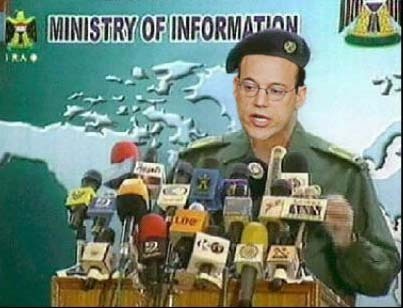 We didn’t see photoshopped photographs of Ari Fleischer looking like he’s serving french fries at the mall or people referring to them as “valley girls” and so forth. I think it’s offensive. ​First, a point of order: Ms. Harf is not serving french fries, but two delicious corndogs and a cup of freshly squeezed lemonade. I portray her as an everyday hero, selflessly serving hungry shoppers who were attracted into the food court by the bright and colorful Hot Dog on a Stick sign. Harf sports their iconic circus-themed uniform and wears a name badge on her “big top” beanie. I, for one, see no dishonor in this common job and believe Ms. Harf would be an outstanding employee for the venerable franchisor. I dare say that the public would be better off with Harf handing out hot dogs instead of jobs for jihadis. Of course I’m poking fun at her in the image, but there was no personal offense intended. As with any female public figure, I’m sure Harf and Psaki have been vilified, derided and mocked on social media and that sexism is sometimes employed. I have no idea if most food court workers are male or female and I’ve never encountered a gender-specific stereotype about these positions. I portrayed Harf as a woman, which she is, and in a female uniform, as would be required, but nothing in the image mocks her because she’s female. I mock her because she’s terrible at her job. 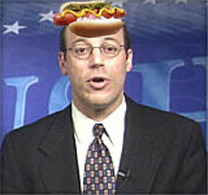 Ari Fleischer was, in fact, Photoshopped regularly, as is usually the case with any partisan national figure. I have seen plenty of degrading, at times sexualized, Photoshops of prominent women on the right and left (Palin by far suffered the worst from that trend). But if Rosen, Kurtz or anyone on Ricochet could explain to me how my masterwork “Marie of the Food Court” is sexist, I would appreciate being clued in so I don’t repeat that mistake. Until then, please accept the fact that American citizens are free to mock government officials. I will continue to do so.